A typical jungle image is monkeys (Spanish = 'monos') swinging from branches of every tree. Well, that expectation is quickly lowered during a walk in the rainforest. Monkeys are common but their activities rarely bring them within sight or sound of humans, unless at remote lodges or where they become tame. In areas where they have been hunted, they are extremely wary and disappear into the forest before you realise they were there. In remote areas far from people, monkeys may be curious of you. If your guide knows the correct call he can attract a troop closer. The Amazon has an astonishing number of small monkeys, which fall in three main groups: true monkeys, marmosets and tamarins. 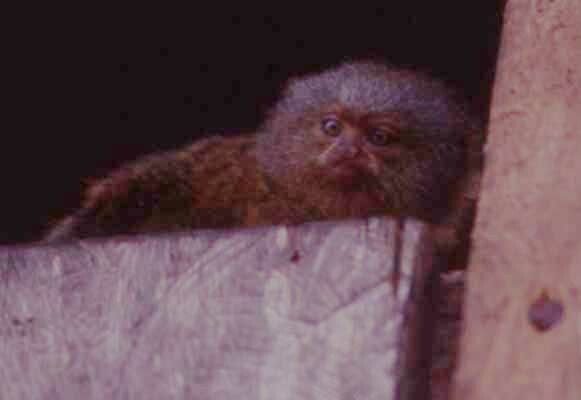 These include the world's smallest monkey, the pygmy marmoset. Most small monkeys lack prehensile tails. The Saddleback Tamarin (Saguinus fuscicollis) is a small, common monkey, found throughout western Amazonia. They are wary and fast-moving, so it's quite hard to get a good look (not to mention a good photograph!). They feed on fruits, insects and flowers. The name comes from the "saddle" of thickened hair around the upper back. 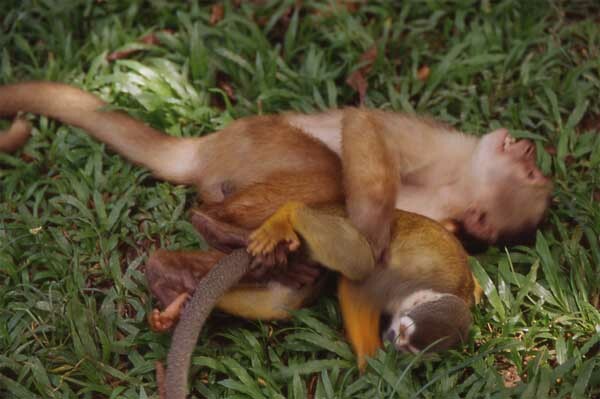 The Squirrel Monkey (Saimiri sciureus) is the commonest Amazon monkey, widespread throughout the lowland rainforest. It has yellow fore-limbs and white around the eyes. They roam around the tree tops in large troops of 20 to 100, making quite a ruckus! They're usually heard before being spotted. They feed on small insects and fruits, and are partial to tearing up flowers to get at the nectar. Squirrel monkeys like river edges and lake sides, where there is lots of vegetation with vines and lianas, so visitors to the Amazon have a good chance to see this species in the wild. The monkey toward the top of the picture is a White-fronted Capuchin Monkey (Cebus albifrons). It has a prehensile tail, unlike the squirrel monkey. 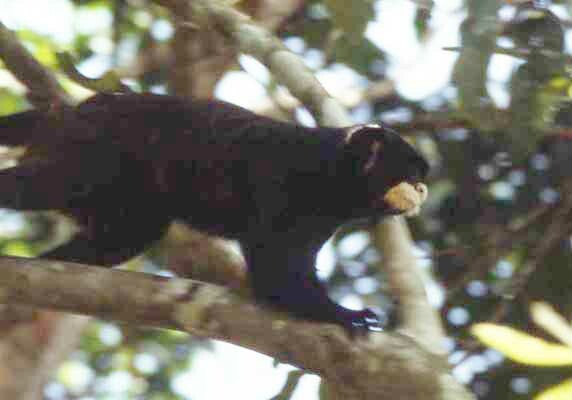 They feed on fruit, seeds and insects, roaming throughout the forest in groups up to 30. This picture was taken at a zoo where the monkeys roam free. In the wild it is unlikely these two species come into contact. Behold, the world's smallest monkey! The Pygmy Marmoset (Cebuella pygmaea) is tiny and can fit in the palm of your hand. It measures 4 to 5 inches long (excluding the tail) and weighs less than 4 ounces. They live in small groups, feeding on tree sap, insects, and sometimes small fruits. Local people love to keep them as pets, but they do not survive long in captivity. The ruff of fur around the head has led to their Spanish name, "Leoncito" (= little lion).